United States Navy (USN), Petty Officer Third Class (PO3 / EW3), Jason William Dies, also known as William or Bill Diaz was last seen on Tuesday, June 18, 1991. 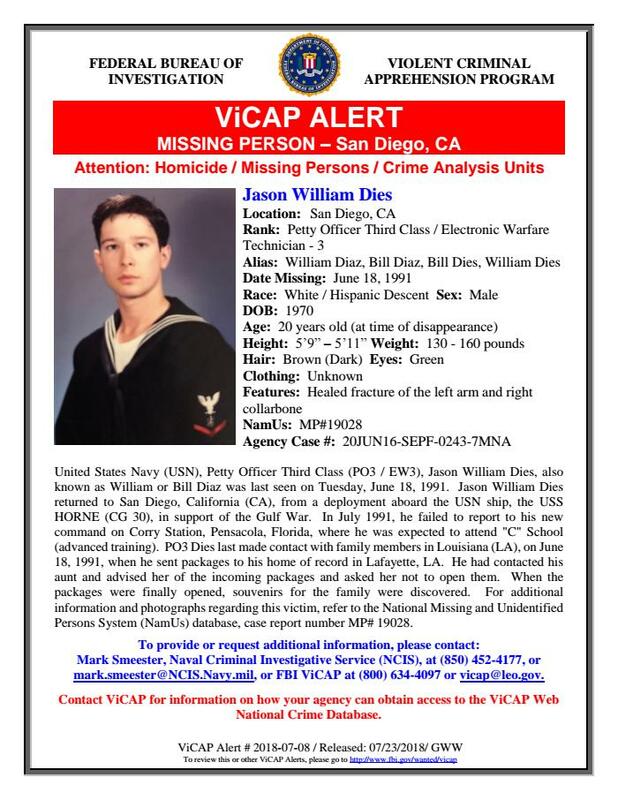 Jason William Dies returned to San Diego, California (CA), from a deployment aboard the USN ship, the USS HORNE (CG 30), in support of the Gulf War. In July 1991, he failed to report to his new command on Corry Station, Pensacola, Florida, where he was expected to attend "C" School (advanced training). PO3 Dies last made contact with family members in Louisiana (LA), on June 18, 1991, when he sent packages to his home of record in Lafayette, LA. He had contacted his aunt and advised her of the incoming packages and asked her not to open them. When the packages were finally opened, souvenirs for the family were discovered.